I saw the opportunity and took it. 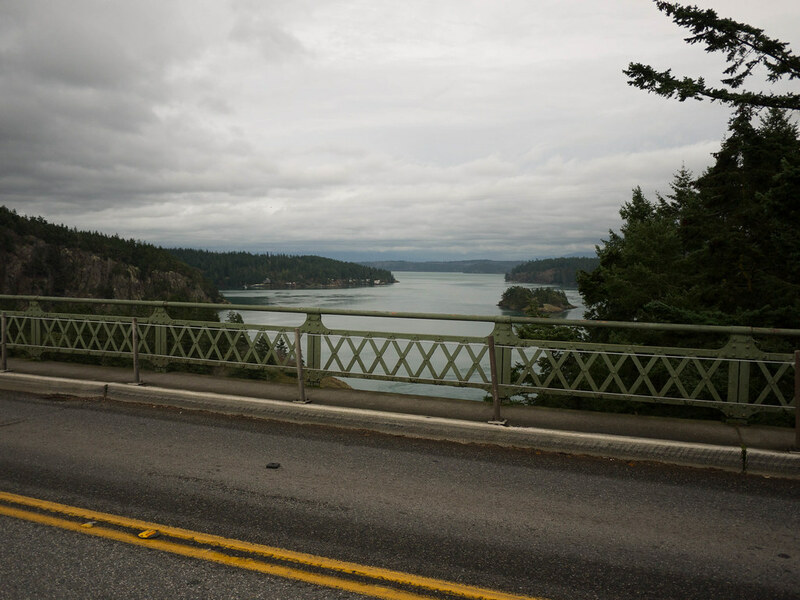 I’ve been meaning to try a ride around Washington State’s largest island since I’ve been coming up here in 2003. 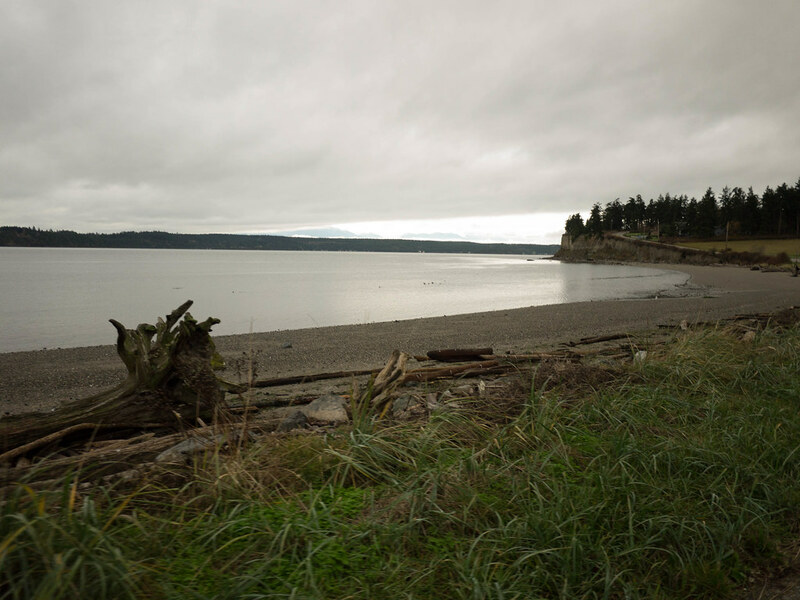 My wife and I fell in love with Whidbey Island at some point, and we’ve had properties here twice in the last 11 years. Last week, I decided to take the holiday week off, and spend some time up here. Now “up here” is a mere 35.7 miles from “home” in Seattle, so I feel a little funny going up to the cabin, as we say in Minnesotan. This is less distance than a lot of folks commute to work every day! When I was growing up, a trip to the “cabin” in northern Minnesota was a 4 hour trip one-way. It was always the last half hour past Brainerd that I really felt like we were getting out of dodge. Now it’s just a short drive north that takes a bit over an hour, and I’m in another world, my happy place. The ferry ride helps. 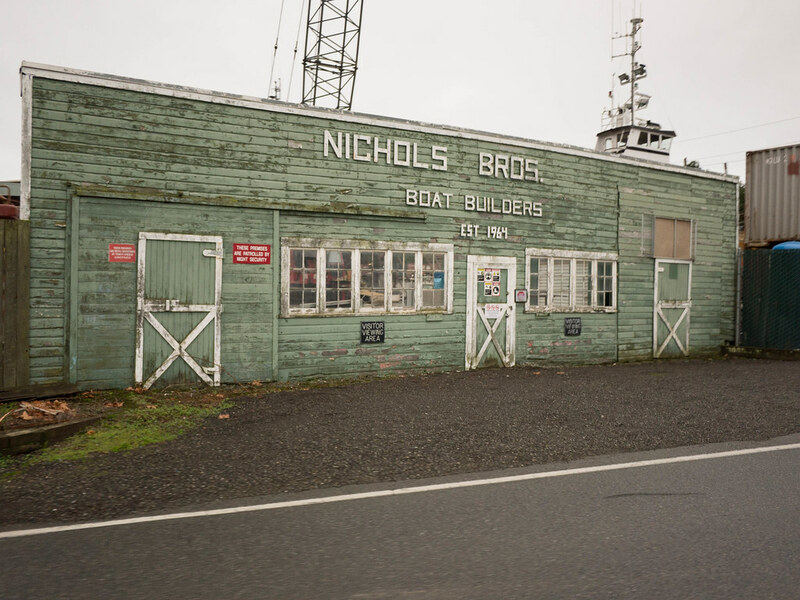 Once you get off the boat, it’s sort of another planet from the urban/suburban bustle of Seattle. There are large tracts of forest, farmland, and a few small picturesque towns dotting the island. A lovely place, really, and it just feels sleepy and awesome! Anyway, on to the ride. The last brevet I had done was a mean, rainy 300k at the end of March. A long, long time ago. 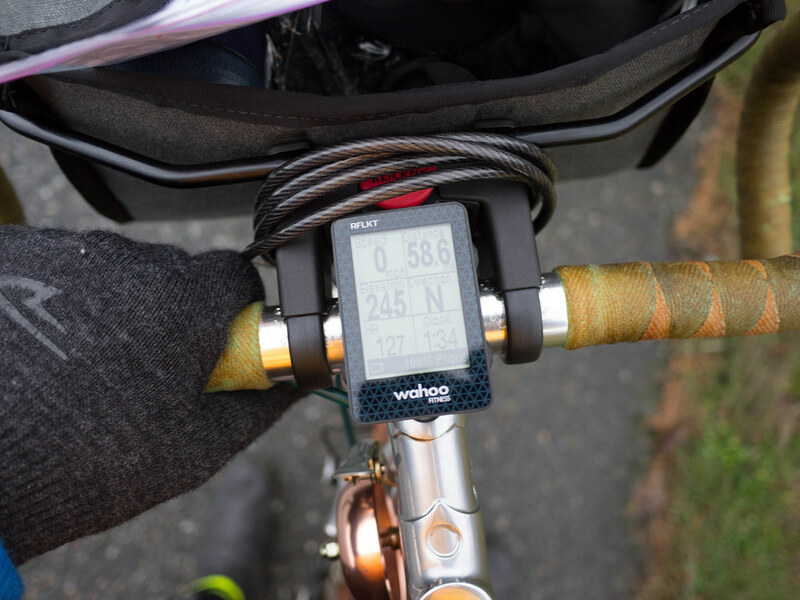 Now I’ve been commuting plenty, and had several 50-80 mile weeks going, so I felt that stepping up to the 126 mile 200k was reasonable, and my fitness was still good. I also tried to ignore the little bird telling me that this ride had over 7500′ of climbing. I figured that this was just a few more hills than a more normal 200k. I thought I would be well prepared. 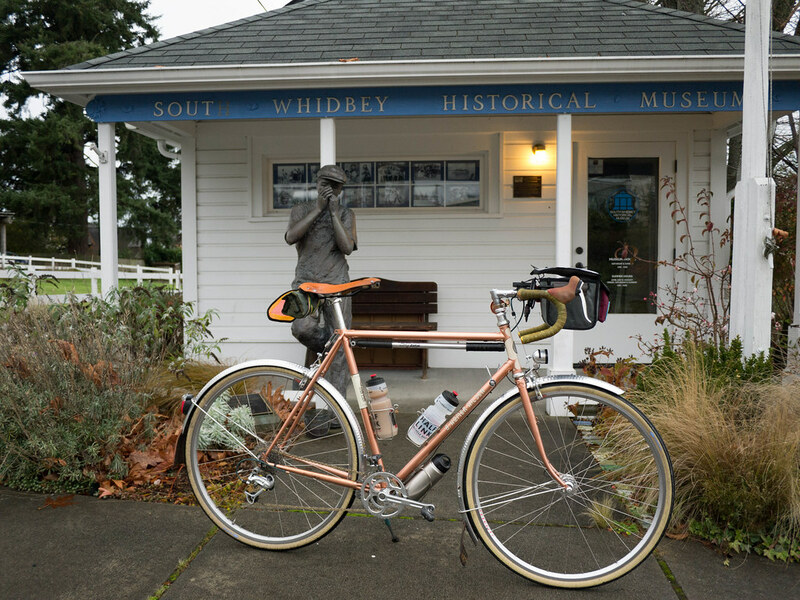 I brought both my rando bikes up with plans to ride the A. Homer Hilsen. I wanted to make sure the shimmy was gone, and the Swift bag worked well on a longer ride. I had most everything packed up and ready the night before, and got plenty of sleep knowing I had a big day in front of me. 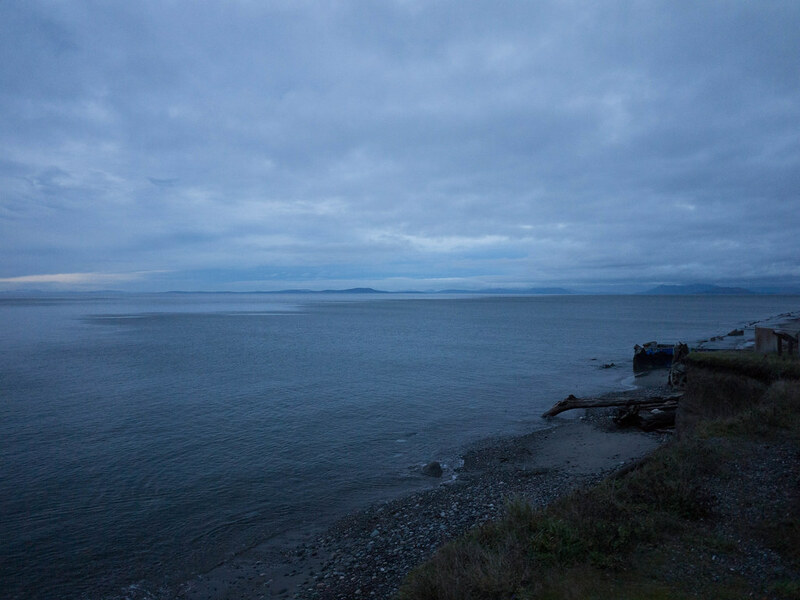 In the morning, I made eggs and coffee, and still managed to get down to the ferry dock around 8:15. I had set my start time for 8am, so I was already running late. After a few more minutes of figuring out where I could leave the car all day, I parked and was off at just past 8:30am. Then I started climbing. The first hill off the ferry wasn’t too bad, but they seemed to just keep coming. I was happy I had a 34 big ring on the cassette, so I had extra granny help. 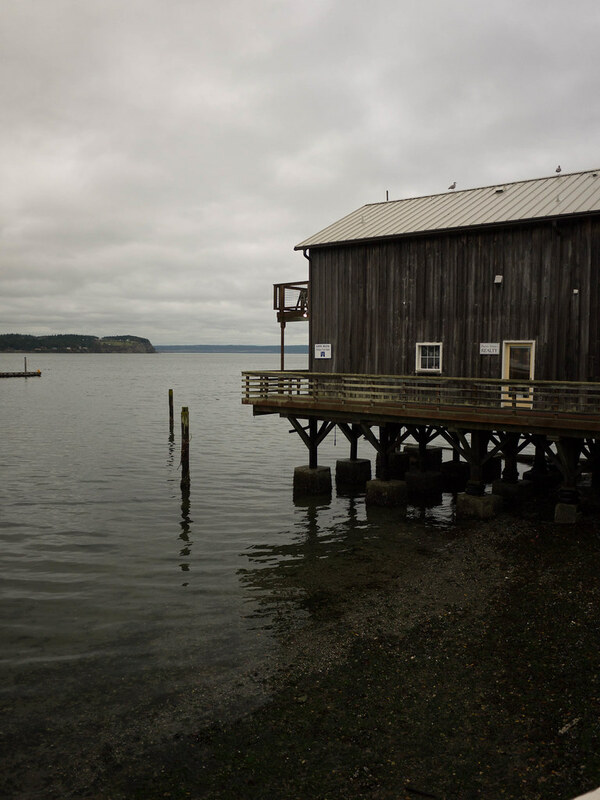 Entering Langley – a small town with an artsy vibe, I wanted to stop at the local coffee shop, but I wasn’t ready for a break. I had packed a rain jacket, camera, phone, wallet, and a few food items in the Swift. I had my tool bag under the seat. I felt that I was packing light, but I did have 3 full water bottles. I wasn’t into the photo mode yet, but couldn’t help but take a snap of the local museum. As I rode on towards Freeland, I wondered if I had too much. The weather was great, and my thin wool undershirt, SIR jersey (also wool), and reflecto vest were keeping me toasty. 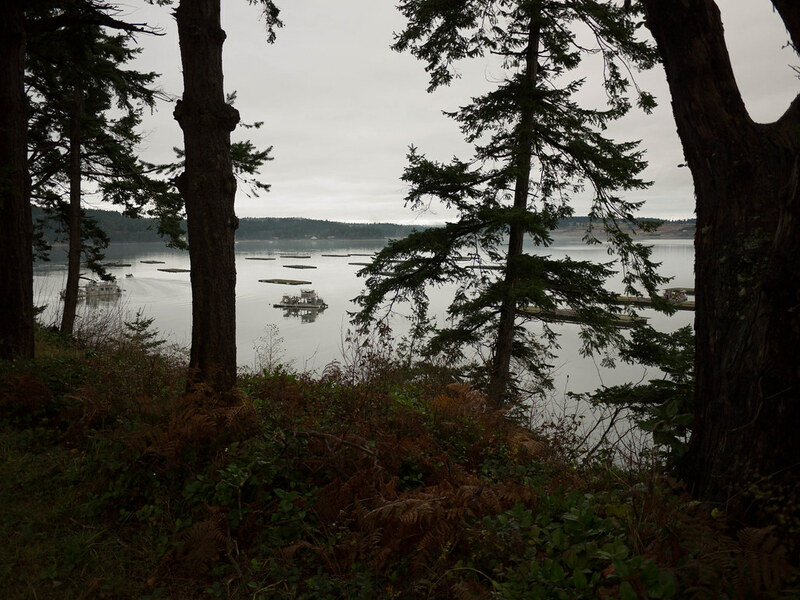 There were lots of eastern beach vistas on the high bluffs to keep me occupied, and there were about 3 cars that passed me in 10 miles. No traffic to speak of, which held true most of the day. The roads were also glorious! Smooth, fresh blacktop that looked to be laid in the past year or two. These islanders keep there roads up really well. That said, I started noticing the many squashed slugs, as well as some small orange salamanders. 1000 slug trails seemed an apt ride name. I hit my first walking hill just after Freeland. Resort Rd. 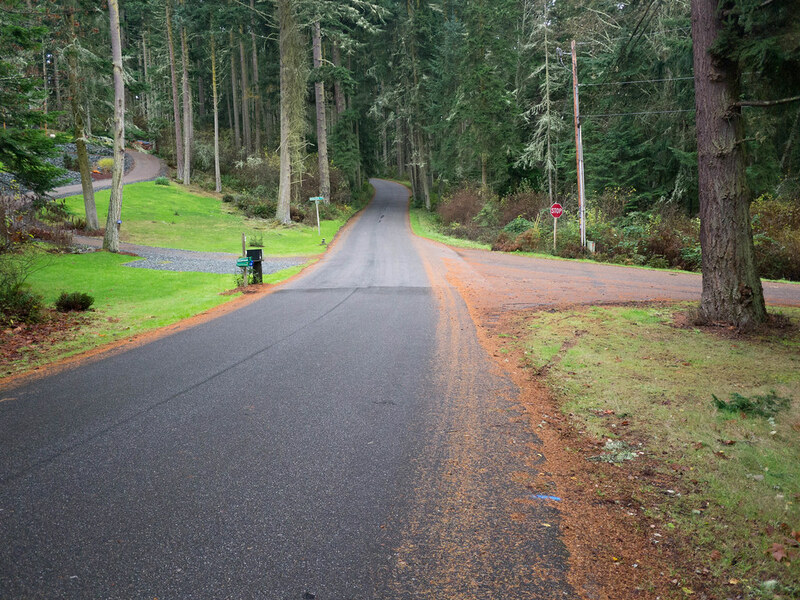 climbs back up to HWY 525, and at 10%, it was a bit much. It gave me a chance to stretch my legs. A nice walk in the woods, really – no traffic at all. The first jaunt on the main island highway was a nice few miles downhill. I was doing 30 with the cars only going slightly faster. 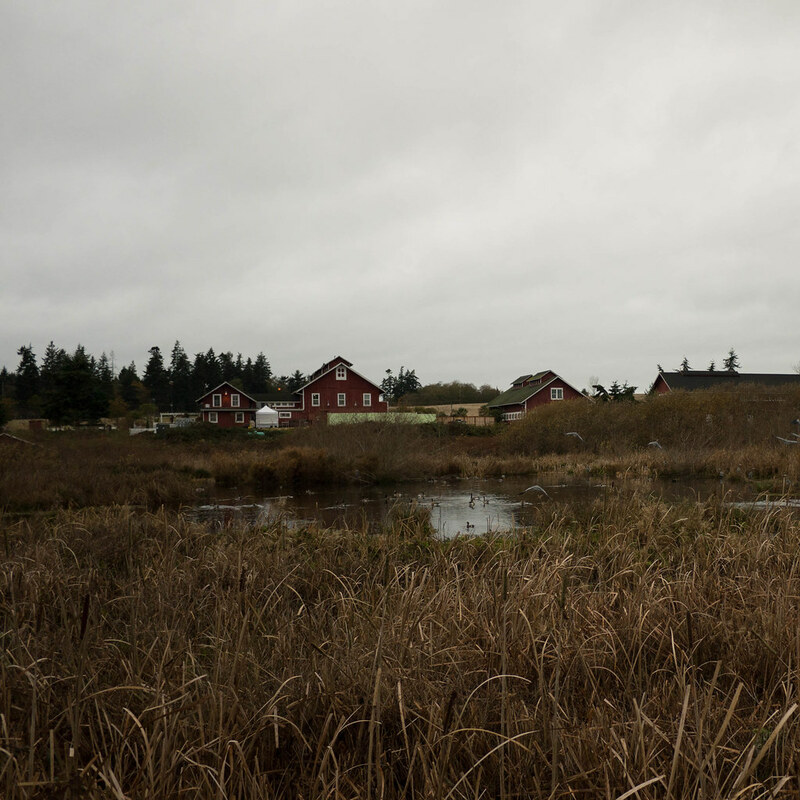 Greenbank is a tiny town at the thinnest part of the island, where if you stand on the field by Greenbank Farm (an old loganberry farm), you can see both Saratoga Passage to the east, and Admiralty Inlet to the west. 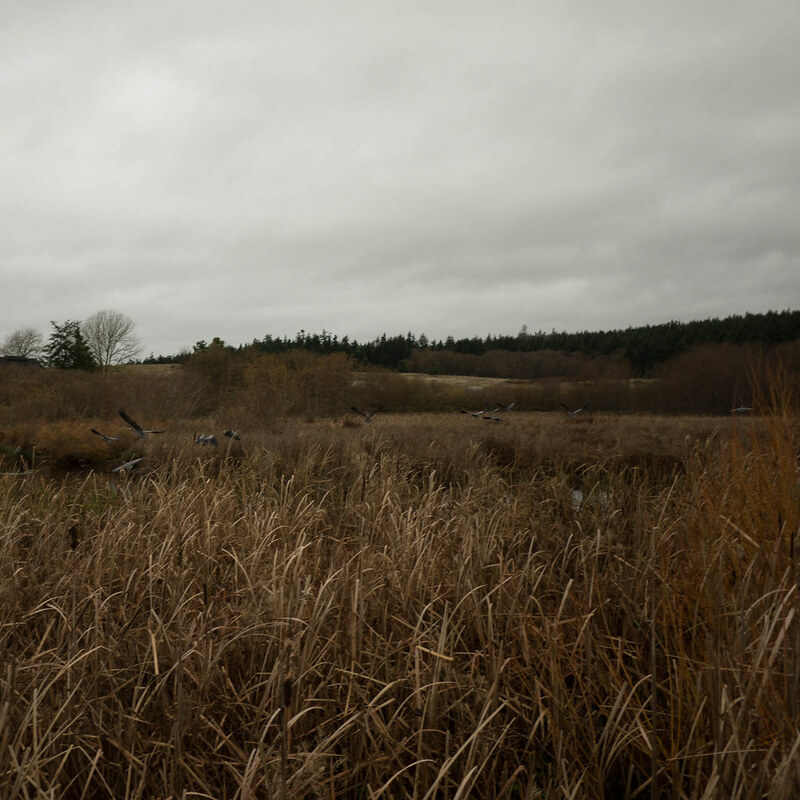 Here, I stopped to photo what turned out to be 20 herons resting/hunting in the marsh below the farm. They all took off when I circled back to get a photo. Onward – I still had a long way to go. The next walking hill was Rhodena Rd. at about an 8% grade just before Parker. This one was a bummer, but it was in another pretty area. I realize that all these hill pics look flat, but believe me, they went UP!!! 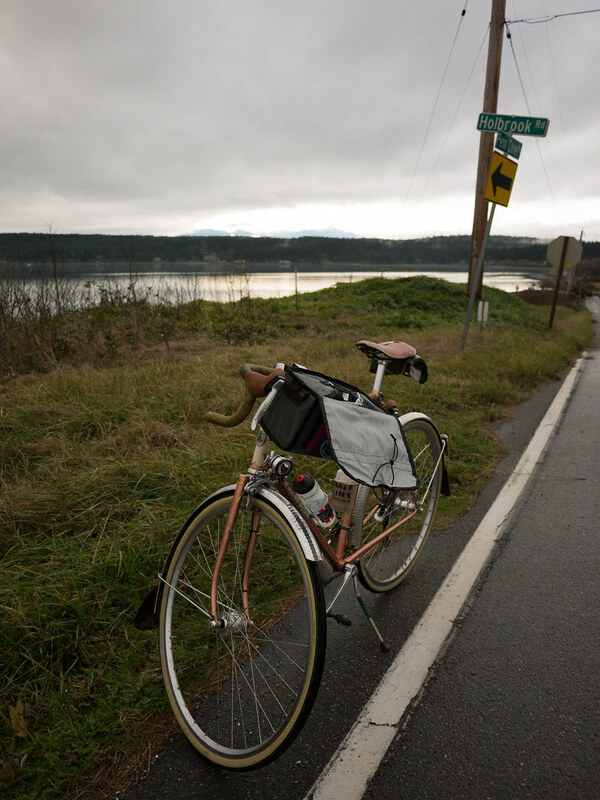 Phew – made it to Coupeville on some nice twisty roads. 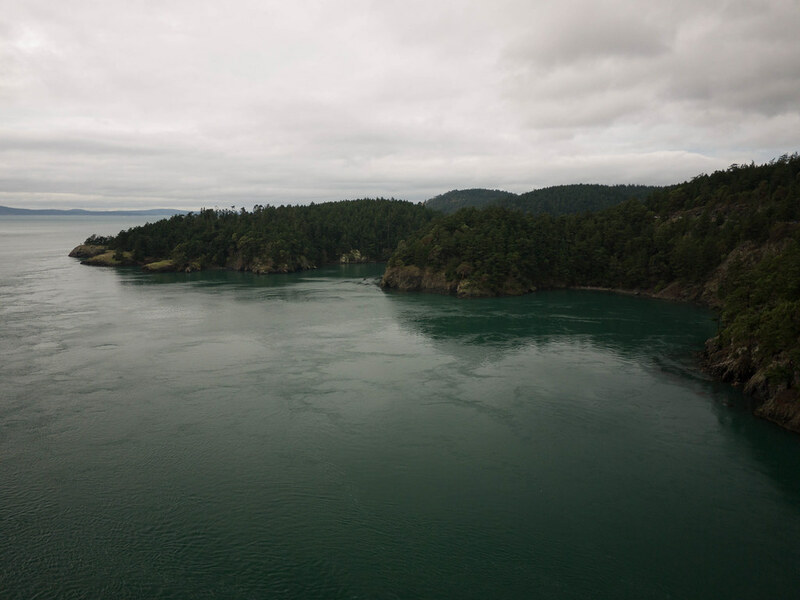 This is a Washington’s second oldest town, founded in 1853 by a guy who evidently was the only person to have sailed through Deception Pass with wind power alone. X-Games circa a long f’ing time ago! Now I could nearly smell the halfway point. 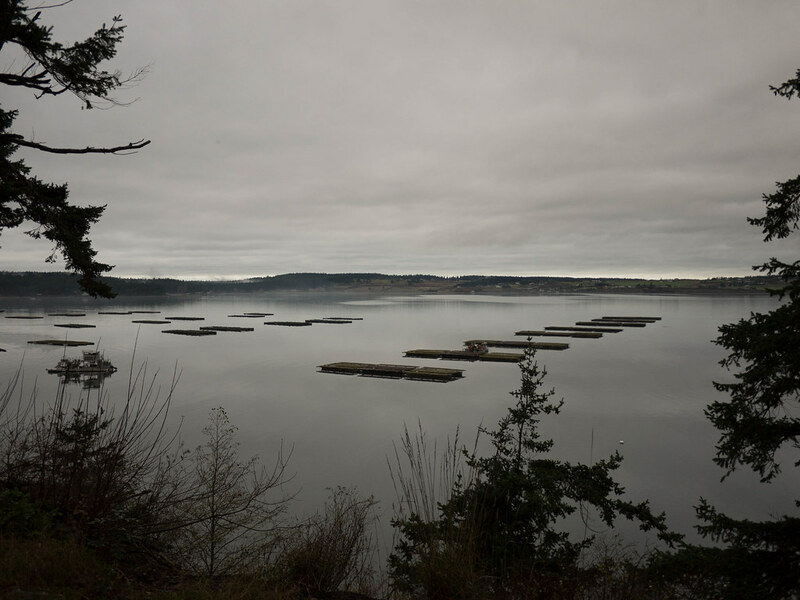 The aptly named Madrona Way around inner Penn Cove offered great views of the mussel farming rigs. 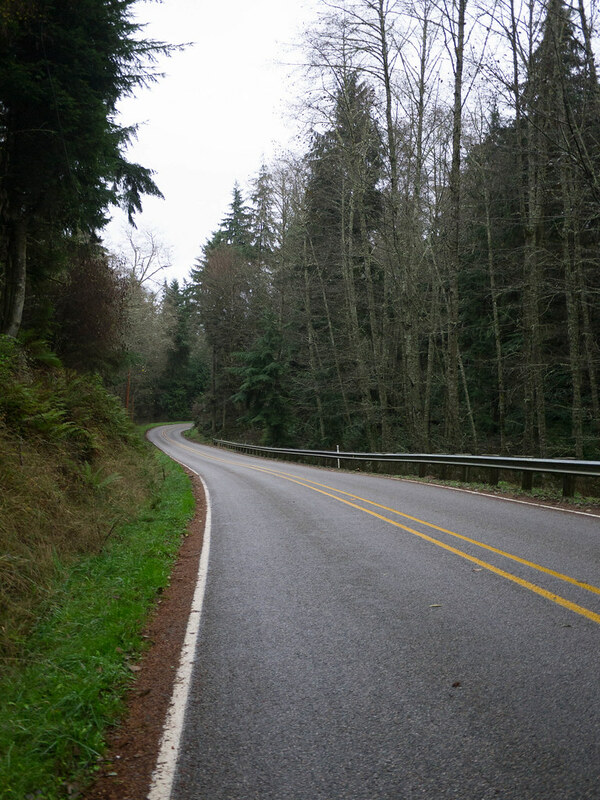 This was one of my favorite rides, with light traffic, nice curvy roads, and great views of the cove. After a few more hills, and some duck hunters on Dike Rd. 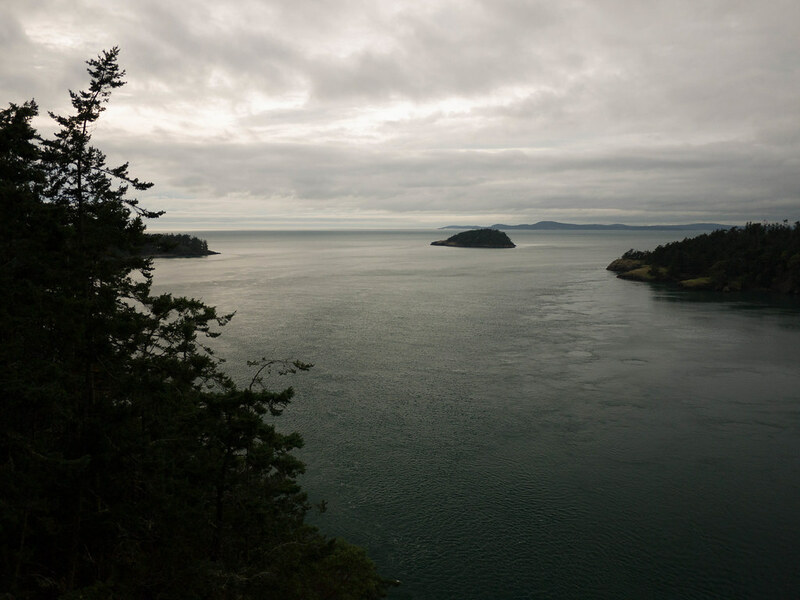 I stopped for a bathroom break a mile from Deception Pass. This was technically past the halfway point, but I didn’t consider it that until I was at the top of the island. I had a reuben and some “power milk” and this picked me up. At the Pass, I watched a seal swimming around the kelp in the shallows. 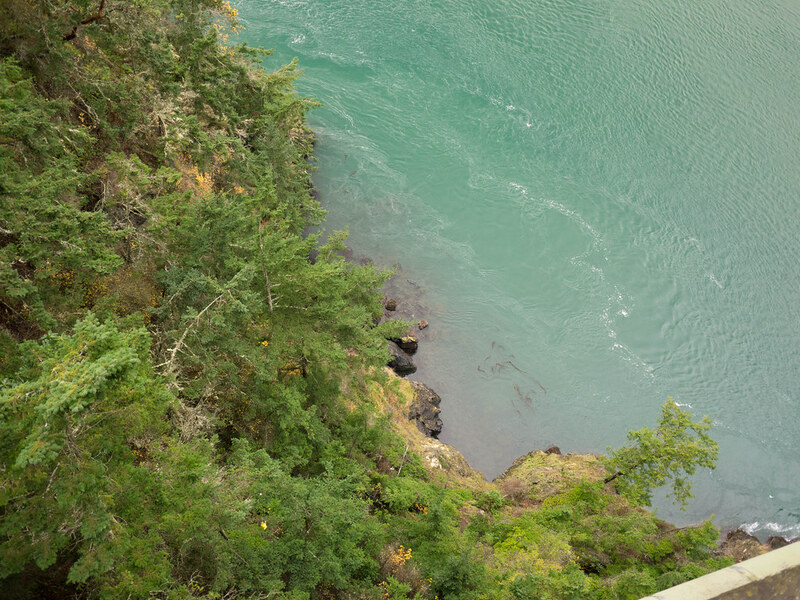 This is a beautiful spot with a high bridge over fast-moving bright green water famous for their whirlpools and standing waves during tidal surges. This was the turnaround point. Next stop was Ault Field after a jaunt down the highway again. This wasn’t too bad, but I was ready to get off the main road for a while. 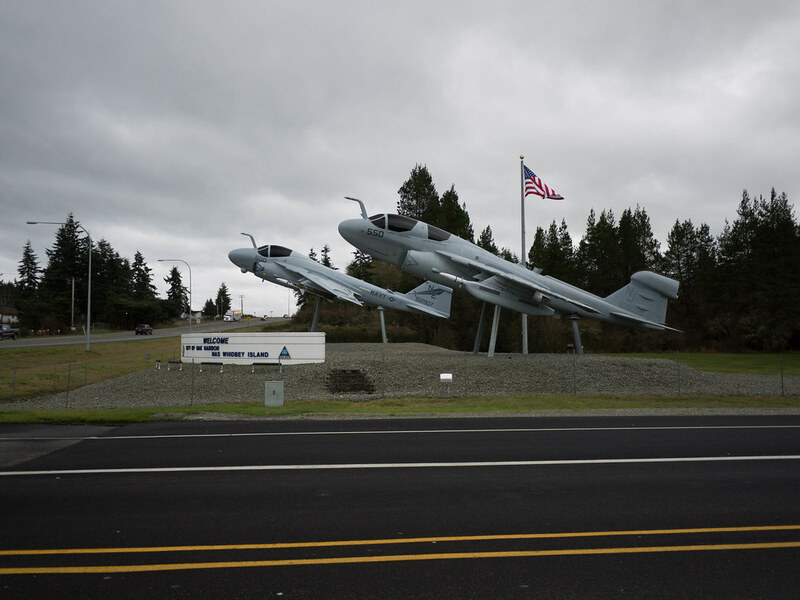 The Navy evidently put their air station on Whidbey partly due to it being in the “rain shadow” of the Olympic Mts. I just figured it was due to the natural beauty – a great place to fly over if you ask me. 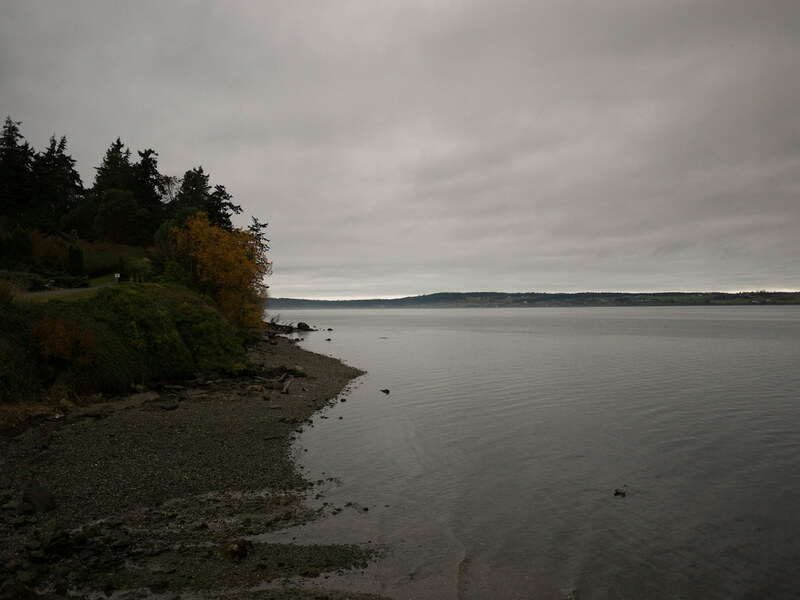 Just past Joseph Whidbey State Park (closed) it was starting to get dark. There was a great big hill climb here, and halfway up, I noticed writing on the road, “Legs Up Shut” – ahhh, there have been cyclists before me on this! The infamous Jens Voight “shut up legs” quote. That was a major pick up for me, and got me to the top of another 400 foot hill. 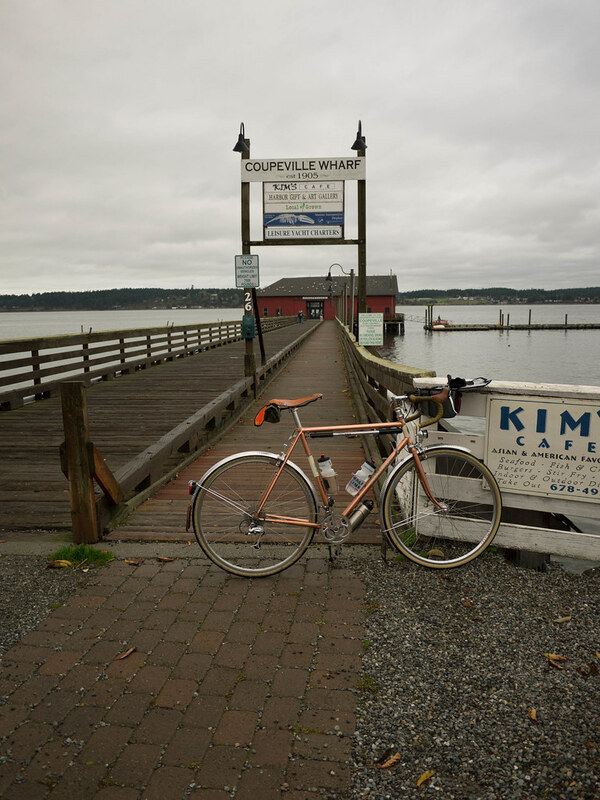 I made a stop at the Keystone Ferry south of Coupeville for another bathroom break. 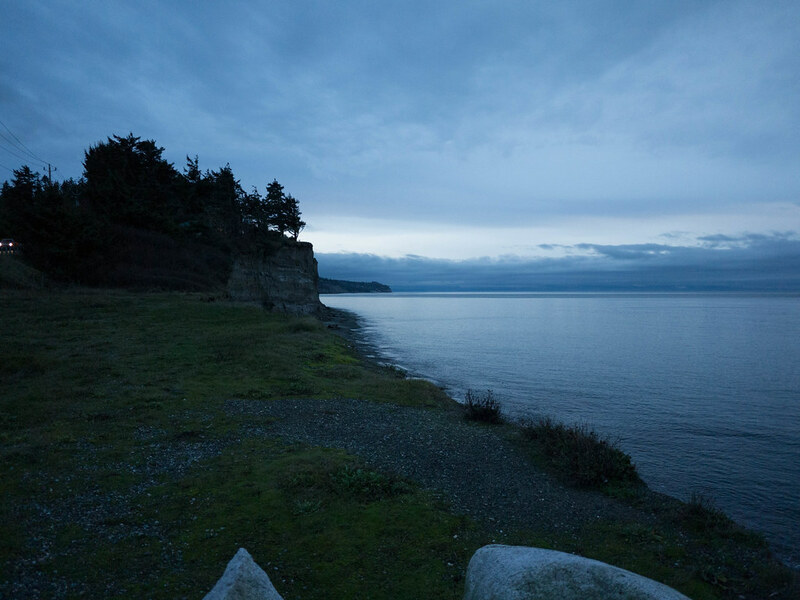 A bit further south at South Whidbey State Park, I filled out my control card while standing in the dark entrance by the street. At this point, I found that I really liked Clif Shots gummy energy bar nuggets! Yum – there is nothing like junk when you are feeling tired. 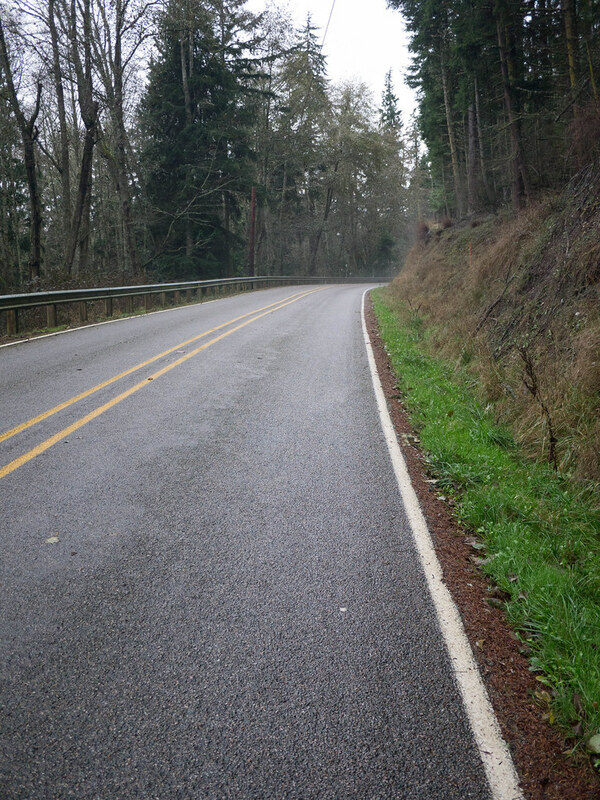 The tiny bits of rain were good at keeping me focused, but really it was just a long old slog back down to Clinton. I had one more walk up Lancaster hill, but that was short-lived, and the last few miles were mostly a cruise along the summit of the hills of south Whidbey. The ride back down to the car was awesome! I had a bikers high for the rest of the night thinking about this great day in the saddle and everything I’d been able to see on the way. Pretty cool way to spend a day off. Special thanks to a very special wife and daughter for giving up Dad on the day before turkey day! Hard to say. I would sum it up as “very similar”. The Swift bag is smaller, but higher and weight is carried a bit further out – potentially. I find them pretty similar. The feel of the ride was fine. I didn’t find the steering wandering much on the many slow climbs on this ride. I will be doing it again on my Velo Routier with the Acorn bag. Besides the bigger tires, it will be interesting to see if I find the climbs the same or better. Brian, wonderful ride report. I’m struck by the pendulum of pleasure and pain you experienced and by your perseverance! 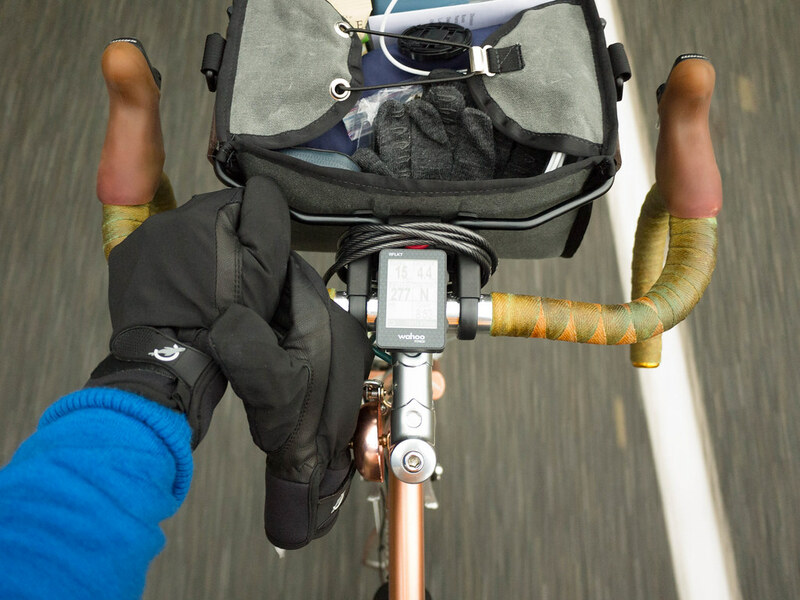 What are your thoughts on the feel of the Homer with the Swift hbar bag vs. the rack mounted rando bag? Quick comment on tires. I rode the Stampede Pass Compass 700×32 for this ride. They were very comfortable over the course of the trip. The only place that registered any road vibration was on the few sections of chipseal. This was not bad, even. Well done! You did the right thing keeping going (says she from her chair); glad you have sorted out the shimmy problem as well. Such dramatic scenery! Around here (Somerset, GB) we have lots of hills (and levels) – see this http://oldbatonabike.wordpress.com/2014/09/16/peaceful-lanes/ which is charming in its own way. We had a family cycling holiday in Cornwall in July and it was amazing! Somehow we don’t always appreciate the places where we cycle all the time. Thanks for a great post!